Producer/Writer Alan Yang had the answer to Asian American invisibility in all of Hollywood. And he said it on the Emmys telecast live before millions watching around the nation. It was the first Emmy win for both. 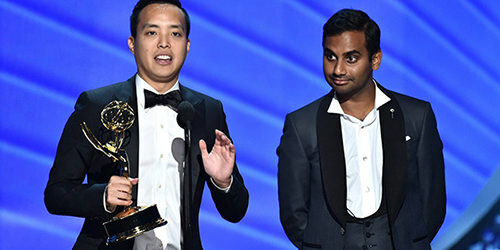 Since it was early in the show, and perhaps anticipating future blessings later in the program, Ansari, the star, deferred to his co-writer and producer Yang. And Yang delivered the jab and the knockout message. It got a modest laugh. But Yang, a Harvard grad and a former member of the school’s humor organization, the Lampoon, wasn’t done with the thought. Perhaps that was for all the parents who pre-paid for the Suzuki lessons. Or for the ones who preferred their kids become a cellist like Yo-Yo-Ma, or a concert pianist like Lang Lang. But Yang’s point was clear for the one-dimensional thinkers out there who put Asians in a familiar takeout box. Go ahead. Break the mold. You don’t have to be traditional Asian anything in America anymore. There is another way. The world doesn’t end if you’re third violin, third chair. There are Asian American inroads being made in just about every field imaginable. Even those that involve imagination. You no longer have to push your kids sadistically into the STEM fields. Now there’s the HAHA fields, humanities and the arts, squared. Because that’s what Asians did, right? Bring that keen sense of biology to anything they do. But then Yang competed for and won a place on the Harvard Lampoon, and there he found his comic calling. After Yang graduated in 2002 and moved to Los Angeles with two fellow ‘Poonies, the showbiz path had begun. Of course, I thought that was all easy for Downey to aspire to. He was a white guy from Joliet. Me, an Asian American of Filipino descent? When I gave the funny speech, the Ivy Oration, as class humorist during my own graduation week, I, too, thought about showbiz. But it was still early in the game. And most of my classmates were still thinking about business school and law school and dreamed of their goal of joining corporate America. That all seemed like the “good” dream, or, at least, the safer bet. Many of them made it. Me, I found a glass ceiling of my own design. I went into television journalism, even though there were probably just as few Asian Americans in that business as there were in the TV and movies of Hollywood. And then there were the white guys with the bronzer sticks. Filipinos like me? We were invisible. 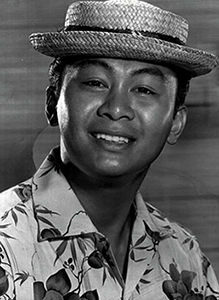 I just thought it would be easier to be the first Asian American in TV or radio news somewhere, rather than being a pioneering Asian American in a Hollywood anything. You won’t say no to me if I can tell you which public official is siphoning cash, or burning damning documents in that suspicious 3-alarm fire. Film at 11. Remember, this was a few years after Bruce Lee began making his impact in his Hong Kong movies like “Fists of Fury.” As Lee’s widow claimed, Hollywood had taken his idea of selling kung fu as a concept to American audiences. But it cast the white actor David Carradine instead. The win was for penning the series’ great “Parents” episode, which honors the immigrant, their struggles and sacrifices. It’s the stuff of comedy because laughter is the only antidote for the pain of being less than what we all could be if only our choices were based on equal access and opportunity. In that way, the “Parents” episode is emblematic of all our Asian American stories. It was a comic, mini-“Roots” moment for all to see. Jimmy Kimmel joked about the Emmys being so diverse this year. Only it wasn’t a joke. Yeah, funny how they’re actually doing something about it. But then Kimmel got in his needling reality check. Ansari, seated in the front row, got up and demonstrated how TV brings people together. He started hugging people around him. But the truth is “Master of None” didn’t take much bravery–not on the part of the major networks. It wasn’t made for the big network audience. It was made for the digital subterranean streaming world of Netflix, where audience size isn’t as critical and doesn’t determine or water down an artistic message. Maybe that’s what hinders good shows like “Fresh Off the Boat” and even “Dr.Ken.” At least Constance Wu and her FOTB co-star Randall Park got some Emmy face time, if not a statue. But as good as their show is, going down a mainstream network, geared for the Peorias and the Joliets, is more restrictive than the auteur visions that one finds on an HBO or Showtime, a Hulu or Netflix. That’s where we find the “Master of None” shows. Not on the not-so-brave main networks. Not yet. But as the storytelling medium changes, where television, movies, cable, and digital all seem to blend, and as the audience changes, demanding new stories that reflect them, Emmy-winning shows like “Master of None” will begin to open eyes. It took nearly two generations, and there’s still a way to go. But with emerging Asian American producers and writers like Yang and Ansari, telling it like we exist, Hollywood stories are starting to include us. Now, if only Asian Americans give up a few violins in order to discover their own voices. Readers know in the last two years, I’ve been on my own personal storytelling trip about being a Filipino American in the media and U.S. history with my one-man show, “The Amok Monologues: All Pucked Up.” I’ve performed excerpts of the show in San Francisco and New York. There’s just something about the Asian American story that still remains under wraps, and it’s time to unravel it and tell it all now.